From our new book series Rocket Babe. 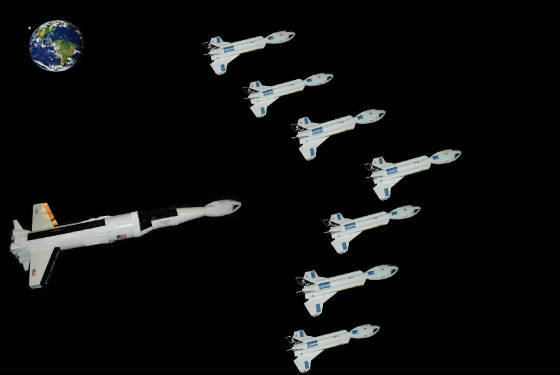 The main weapon of the Deep Space Strike Force is a heavily modified Saturn V with launch/landing decks and extended Cestris Bridge. Aft view: Five F1-D engines. Yes, at some point the PANDORA will fly! We left in the bells for the photo here but they're removable for flying. We'll just swap them for the 5 engine removeable cluster mount and off she'll go! What? Did you think we wouldn't cluster it? For detailed building instructions for your own 5 engine clustered PANDORA go here: http://www.sears572.com/supersaturnv.htm then add the launch bays. Forward section with extended Cestris Bridge, sporting custom Sirius name plate decal. The U.S.S. 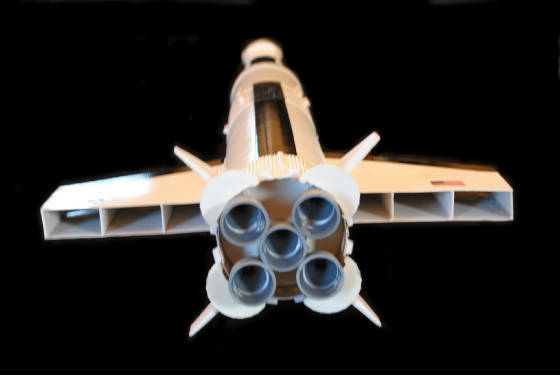 PANDORA is basically the Estes 2157 version of the Saturn V with a Sirius Cestris bridge for a nose cone and with slotted wings on either side. For the most part the build is straight forward per the Sirius and Estes instructions. 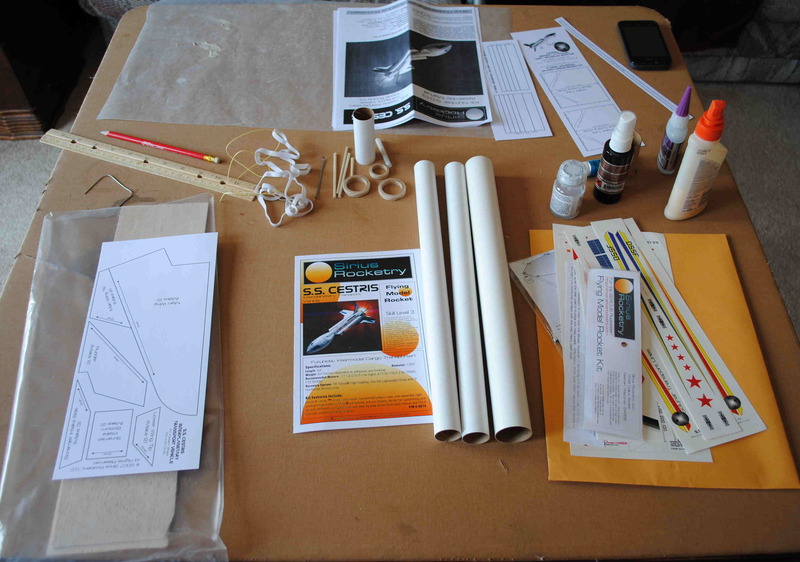 The only modification to the Estes portion of the instructions is a slighter longer reduction wrap from the upper 3rd stage wrap, to the shoulder of the nose cone. Just use your own heavy stock paper. If you can make a cone, you can make a longer reduction wrap. It took Verna all of 3 minutes to make hers. Building and attaching the launch and landing decks is not difficult. We used 1/8ths basswood and cut it to the deminsions shown on photo below. We also cut strips to seperate the landing decks into equal sections. If you decide to build your own PANDORA or Cestris Fighter be sure and send us a photo. We would love to feature yours on Fire & Smoke! Let me start by saying I found building the S.S. Cestris to be a lot of fun!!! 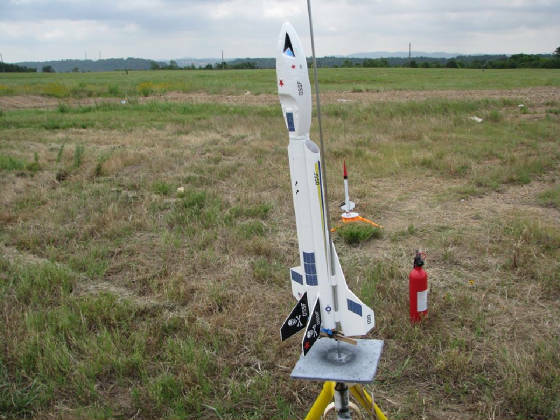 About three years ago, David & Evie Miller, owners of Sirius Rocketry, added a great, low to mid power kit, to their already large and successful line up called, S.S. Cestris. 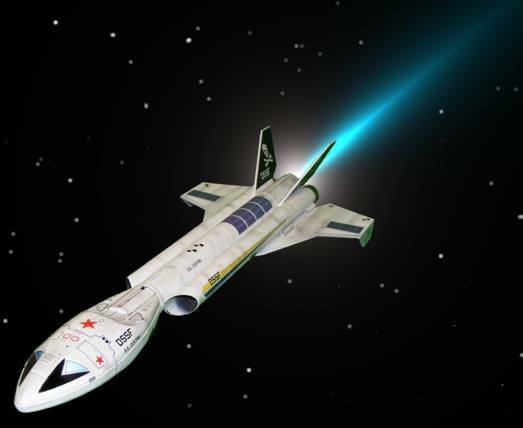 The Cestris has a fantastic sci-fi look that harkens back to Apollo era spacecraft and not only was it love at first sight for us but the perfect, flyable, and natural choice for our book series, Rocket Babe. 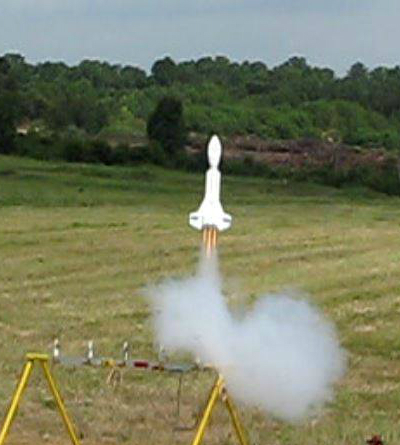 Building the Cestris was the most fun and enjoyable kit we have worked on in a very, very, long time and you can expect to have the same satisfying experience with any of the rockets in the Sirius line. 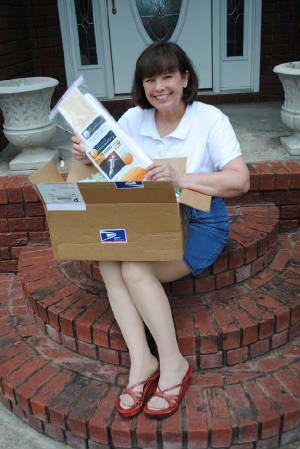 There are several very good manufacturers out there, who provide wonderful kits and we’ve built those too, but personally, we consider the “Sirius experience” to be the closest to the early kits from Centuri and Estes. 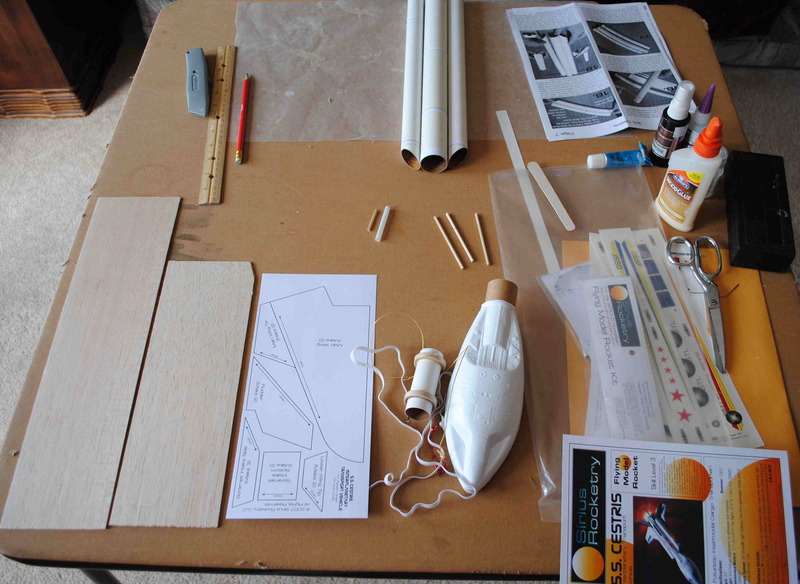 I think most “Old timers” would liken them to the kits from the golden era of model rocketry, i.e. 1960’s and early 1970’s. We loved all the hands on pieces; measuring, cutting, sanding and fitting many, many parts that require a variety of adhesives and construction techniques. The nose cone is a build in and of its self! I don’t recommend the Cestris for your first build, perhaps your third, but any experienced hobbyist can build Cestris and expect to test and hone building skills. Did I mention it’s just a lot of fun? Starting my SPECIAL EDITION VERNA STARR DSSF CESTRIS FIGHTER! 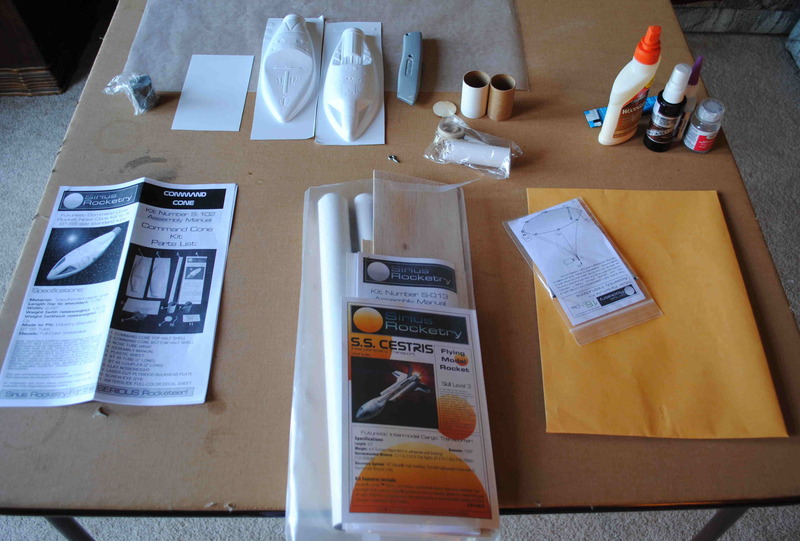 The Sirius S.S. Cestris is great to build and a real modeler's dream kit! If you grew up in the golden age of modeling (1960's) you will absolutely love building this kit! Lots of parts, many steps and a very enjoyable "detailed" modeling experience! Use the templates to make beveled cuts! 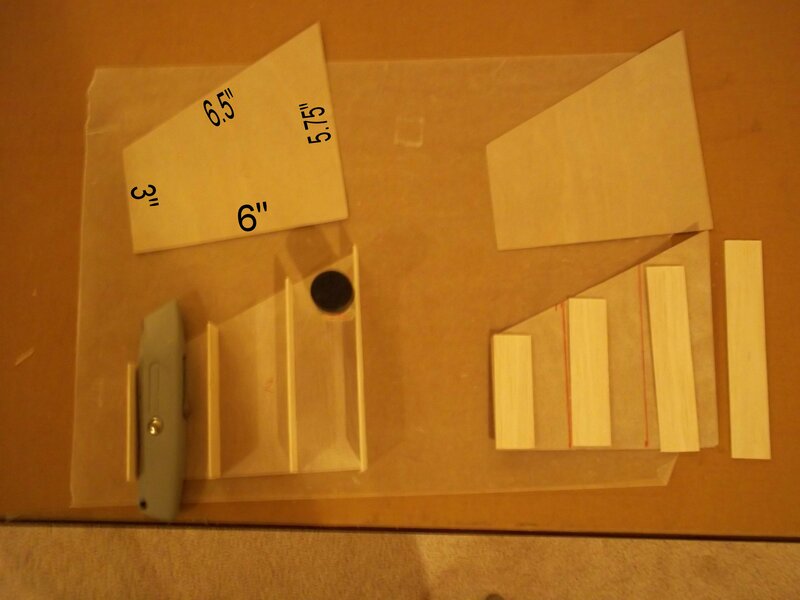 Cut your own balsa parts! Many engine options! 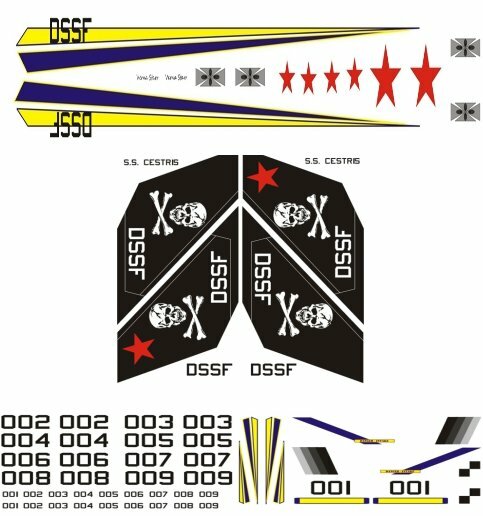 Many sets of decals to choose from including DSSF Fighter version! Step by step photo illustrated instructions. *Make sure you indicate which decal sheet you want! That's right, the Sirius S.S. Cestris kit can now be decked out with the official DSSF markings from the Rocket Babe book series! There are 2 options for the Jolly Roger tail decals. Use the skull & cross bones with the red star to indicate you're flying as Verna Starr or the standard set without the red star and use your choice of corresponding number to indicate a different character from our new novel, Rocket Babe-Fallen Angel! David lists the kit as a skill level 3 build but we think, that like us, he is using the ORIGINAL, 1-4 building scale, and while it will not take you forever to complete the ship, you just might want it to. It’s not your quick fix, snap together, “Let’s go crash another one” type of bird. I found the builder’s satisfaction level to be very high and close to that of a 1/100 Saturn V assembly, just a little shorter. The Cestris is one project you will want to take your time with and savor every second! Not only does the Cestris have a unique silhouette David designed the kit as an Interplanetary Transport Vehicle (ITV) and the kit comes with several appearance schemes and markings for everything from a freight transport, to interplanetainer, to hospital ship. It can be flown “Plain Jane’ or dressed up like a Christmas tree! Or, if you are the hero or heroine of a sci-fi novel, with only a few decal adjustments, Cestris can be made to look like a deadly, cutting edge, high performance fighter! 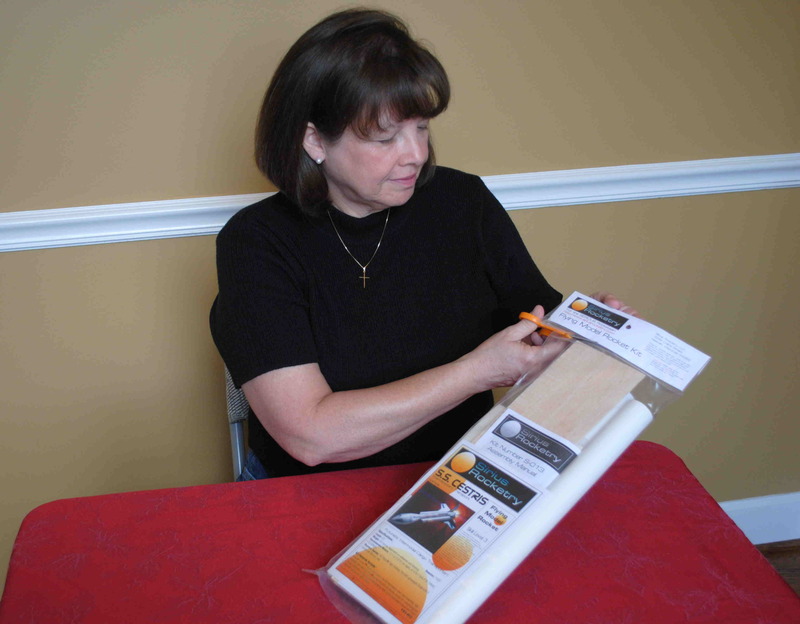 Of course, all materials are top notch and the kit is very reasonably priced at $27.99! Detailed and well illustrated photo instructions are included, along with cutting guides, Mylar chute with Kevlar cord engine mount anchor. Build and fly it right, and you’ll have many successful flights from this one! Now, if you’ve been here before or know us at all, you know we love building and flying clusters and for us Cestris is no exception. I added a little nose weight and a couple of engine mounts to the nacells but that’s all it takes to have it clustered. In keeping with the story line from Rocket Babe - Fallen Angel, ours will fly on a core D-12 with C6 outboards. I haven’t decided on the delays just yet, so yes, it will fly at some point but for now or until I can find time to build another one, it may be spring before we see her maiden flight. 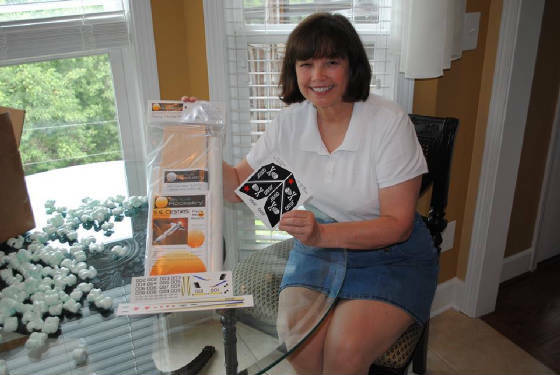 If you purchase a Cestris from Sirius http://www.siriusrocketry.com/SSCestris.htm be sure and specify if you want the Verna Starr DSSF Jolly Rogers decals with your kit. I’m not sure if David will substitute them for the standard decals at no cost, or if there is a slight additional cost to get all of the available Cestris decal sheets. Just ask David. And tell Dave, Rocket Babe sent you!